There’s a lot of mythology surrounding the Desert Eagle .50 Cal. Serving as the long-time favorite firearm of action heros and villains alike, the Desert Eagle has that special something. Find out what all the fuss is about by shooting a Desert Eagle 50 Cal. You would think that any rifle would be more powerful and frightening than a pistol. The Desert Eagle is a major exception to this rule, as you’ll find at gun ranges in Vegas. In fact, this handheld gun actually used bigger bullets than some assault rifles. The .45 Caliber bullet is used in many rifles, while the Desert Eagle fires a monstrous .50 Caliber. It’s not uncommon for people to be thrown off balance the first time shooting a Desert Eagle 50 Cal. At Machine Guns Vegas you’ll have the advantage of one-on-one oversight from a safety and shooting expert to help you plant your feet and brace for the blow. The Desert Eagle is built more like a rifle than a handgun. The gas-operated kickback mechanism is what makes shooting a Desert Eagle 50 Cal such a powerful experience. Any handgun you shoot at gun ranges in Vegas you can expect to pack a real punch. 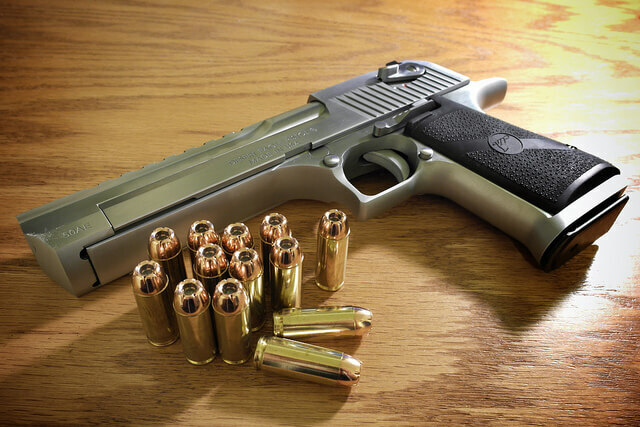 The Desert Eagle is the ultimate counterexample to the claim that bigger is better. The standard Mark XIX barrels found on Desert Eagles includes a scope mounting base, making it easy to throw on a scope. You don’t need a rifle to get the precision shooting of scope shooting. If you love the satisfaction of burying the bullet in the bull’s eye, shooting a Desert Eagle 50 Cal is the pistol for you. The Desert Eagle is built for customization. Starting from the basic design, you can customize an Eagle to shoot as a .357 Magnum, .44 Magnum or the classic .50 Action Express. Machine Guns Vegas is the destination for making your own shooting experience. Choose from the wide variety of solo or partner package deals including Just Divorced, Femme Fatale, and bachelor and bachelorette parties. There’s no experience like shooting a Desert Eagle 50 Cal among friends and gorgeous Gun Girls. Located close to the Strip in Las Vegas, Machine Guns Vegas is the place to go for the thrill and emotional roller coaster of a gun range.